Is God Abstract or Concrete? Hello everyone and welcome to Episode 5) of Active Listening in Jazz. My name is Dan Adler and today we’re going to start to unlock the story of how melody and harmony are interrelated in Jazz. In the previous episodes we spoke about the tune ‘So What‘ and we showed its structure and talked about how Bill Evans explained that structure as 16 bars of one particular scale, followed by 8 bars of the same scale half a tone up and followed by 8 more bars of the original scale. And now we are going to ask ourselves ‘How does this work?’ . How does it work when we have chords and make melodies on top of them. And to do that we first have to talk about harmony and music in general. Harmony is really an outgrowth of physics, the structure of our brain and most importantly culture. The way music develops within western civilisation as opposed to say the way it develops with eastern or arabic civilization where quarter tones were used. Within the western civilisation semi tones were the smallest structure or the building block, so tonal harmony and melody developed based on that. 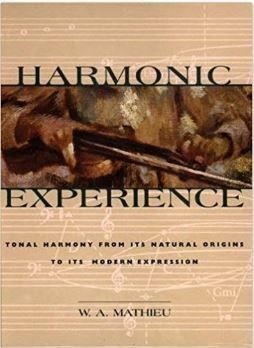 And I’m going to read you a definition out of this from Harmonic Experience and the definition goes like this: ‘Harmony is about the agreement of things with one another’. (that’s actually the meaning of the word in Greek) ‘Among musicians the term harmony usually refers to the way tones relate vertically – stacked up and sounding simultaneously as chords’. Playing multiple notes as one chord, we call that harmony. ‘But a broader musical definition involves the way the ear relates pitches to one another in every dimension, including the agreeableness of an entire piece of music’. So whether things sound good to us or don’t sound good to us is again a function of history and of culture and of physics. the understanding that notes or musical tone are frequencies and that when you half the length of a string you get double the frequency. If you take one third of the length of a string you’re going to get 3 times the frequency. 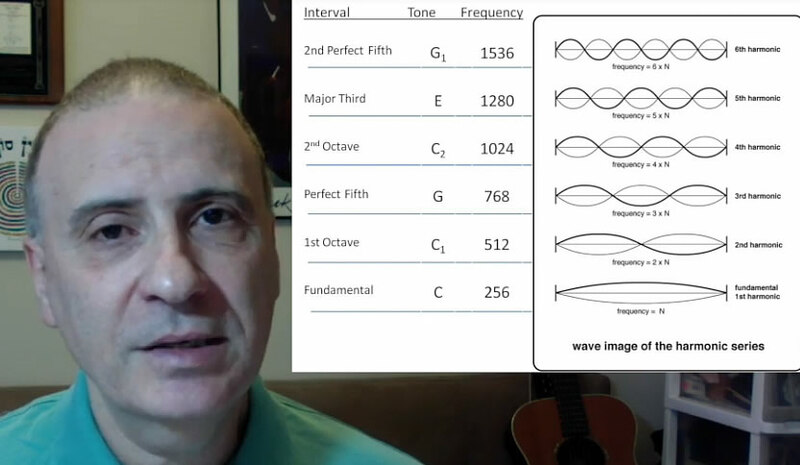 Three times the frequency will relate to something we call in music ‘a perfect fifth. When you divide the string into 4 equal parts you quadruple the frequency and you get an octave. And when you divide it into five is when you get a tone we call ‘a third’. And this 3rd interval is really the foundation of western harmony. 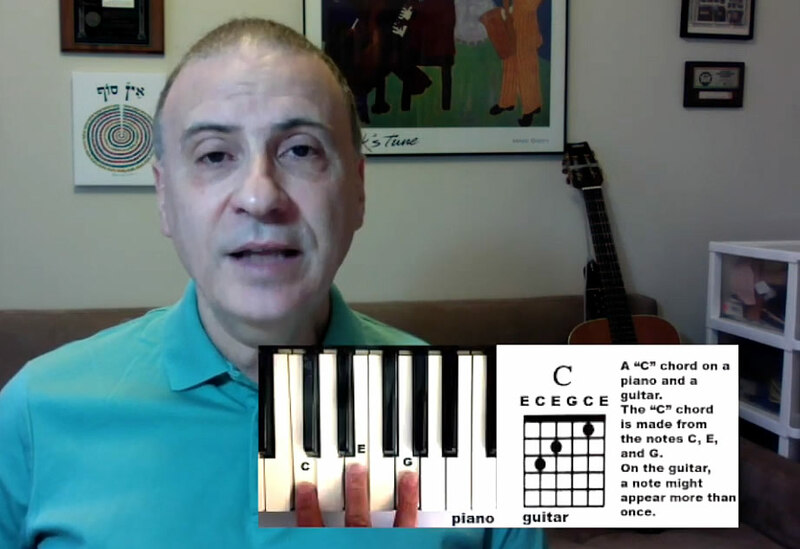 So to understand how this works we’re going to go back to the tune ‘So What’ that we discussed in the previous episode and I’m going to try to show you how the chords to that relate to the scales as were mentioned by Bill Evans in the description that we read. So here I’m using a virtual piano and on this virtual piano you can see the notes and I can play them and what you can see is whenever I play every 3rd note, this is the 3rd note, 1, 2, 3 … those sounds are when I play them together, that is a chord or a major chord, made up of 3rds. The next chord if I move over and I take the 3 white keys that are spaced 2 apart, this will be a D Minor chord. This will be the chord that is used in the tune ‘So What’. In fact it says D Minor 7 in that chord chart that we had before. D Minor 7 refers by taking every 3rd note and by taking the next one. If you see what happens here when I play the 1st, the 3rd and this the 5th then the next one would be the 7th. So I have a 4 note chord and this is the sound of a D Minor 7 chord which is the chord that is used in ‘So What’. And all I did was use every other white key starting from the note D and that is just a beautiful chord based on the way the keyboard is laid out and based on the way the tonal relationships work and based on the way our ear perceives it and that comes out of the music. So now when we play these notes together the question is what notes would sound good on it and we can see that we play the same notes in the octave above that will sound good. If I also play all the white notes from D to D that will also sound good. And that in Jazz lingo or in musical is called Dorian scale or Dorian mode and basically its just the white keys between D and D.
So now getting back to the tune ‘So What’, we want to look at the melody. The melody starts at the 5th note on the scale and then it’s just really 5 notes consecutively and then back 2 down and back up to D. So that is how the melody works. And actually the same melody could be played from the first note of this scale and would sound like this. Combining both of them. Differing ideas can be played on the same chords now for example if we go … that’s one of the ideas the Miles plays in his solo and then … that’s another idea that Miles plays in his solo. There are many melodies that I could play on top of this one chord and that would either come out of the scale and sound good because they are part of the scale or they might include some passing tones say in this case some passing tones because it was on the way to another tone in this scale. Again these are just an outgrowth of the way music works. The way the keyboard is laid out and the way things sound to us. The fact that you can play a chord and put different melodies on top of it is really the heart of what Jazz musicians try to do. And so the material that Jazz musicians use in order to figure out what to play on top of a set of chords originates from the chord scale or from notes within the chord, or from something that relates to the music to the melodic structure of the underlying harmony. We can relate this back to the more general question ‘What are Jazz musicians doing? They are taking a structure which we call the form ~ in the case of ‘So What’ we were talking about a 32 bar form. That means 32 bars of music that get repeated over and over again, until with the melody in the beginning, the melody in the end, and then the chordal structure ~ meaning the place where the chords change and the form repeating itself. So you have this constant piece which is really you can say ‘these are the rules’. 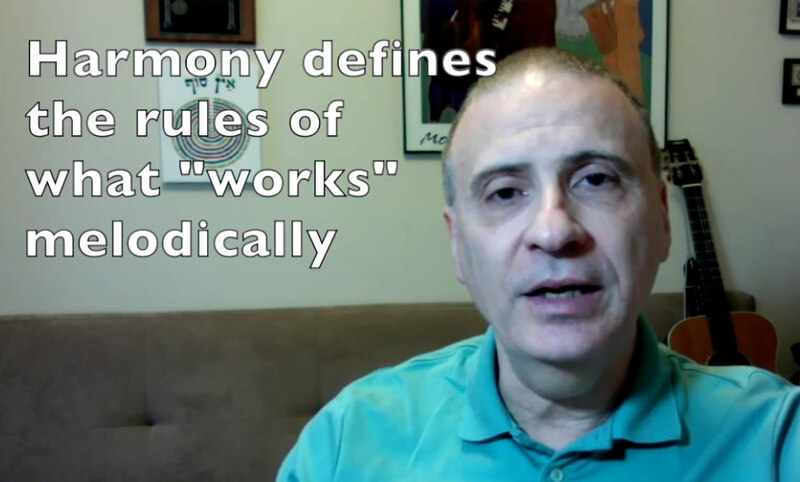 We saw right now exactly how the Harmony defines the rules for what ‘works’ melodically or at least gives you the universe of reasonable things to play on top of a given form or a given chord structure. And then its up to the Jazz musician to figure out what to play out of all those possible notes in order to play alternative melodies on top of this form and on top of this chord structure. So really now this starting to get to the heart of the question of what people are doing in Jazz and as we said in the first episode the idea of how you create one minute music in one minute time. And the way it works is through the set of rules that say keeping the form constant and keeping the set of chords constant that we call the chord changes and then on top of that I’m going to try and invent melodies. Historically speaking this is a huge breakthrough. Until Jazz was invented by the early African American innovators the idea in music was always that you had a Performer and you had a Composer. The composer created the music over a lengthy period of time. Sometimes weeks, sometimes months, sometimes years. And then the performer would study the music, learn all the nuances and would perform it to the audience in a way that was optimal to hearing and which expressed their own individuality. But in Jazz we took the composer and we took the performer and we put them together and we left zero time between the composition and the time of performance. And so the Jazz musician has to be both a composer, has to be a Musical Theorist, has to understand those relationships between the chords and the melodies and also on top of that has to understand Rhythm and on top of that has to Interact with all the other people in the group. So you have a form of Collective Expression with some rules and within those rules the musicians are creating something new and every time they play it although some parts might be constant the vast majority or at least some parts of the form are going to be improvised. And those are going to be different every time. And they are not just going to be different in terms of the notes that each soloist play, they are also going to be different in terms of the interaction between the group members and how all of those things come together to a performance. So really you are starting to see the ingenuity of Jazz where you have musicians that are at the same time are creators, that are theoretical thinkers and they are musical composers and all of that is happening in real time. It never really existed in the history of music in the history of human expression the idea that multiple people can be together on one stage and one place and create something together at the same time. You have other forms where people might be improvising or working of each other say like comedy improvising. Here they are all working at the same time. They are creating something together and really it is a unique form of expression. And the more you learn to appreciate what is going on within this context of a Jazz ensemble you will start to see how unique this is as an Art Form and why people who are Jazz fans think about this as really something unique in the history of human expression. So thank you very much for joining me for Episode 5) of Active Listening in Jazz and I’ll see you in Episode 6) Jazz Expression. 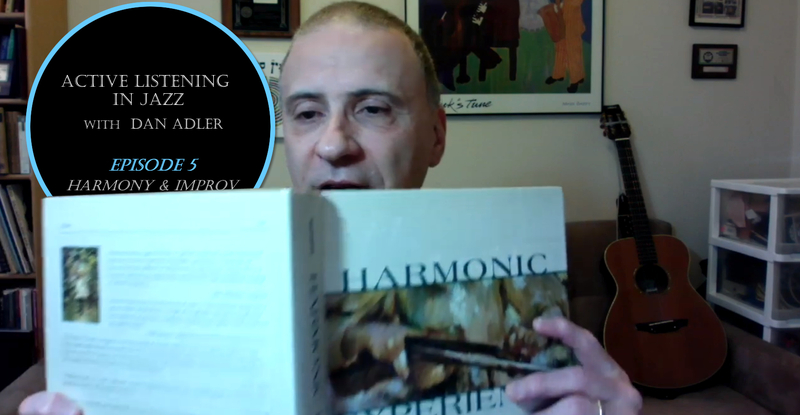 Check out my Active Listening in Jazz for Non-Musicians Facebook Group. Join today to find out more. See my Active Listening in Jazz for Non-Musicians Youtube Playlist. Subscribe to the playlist to catch new episodes.